So what accounts for the difference? Imagery, for one. After the Exxon Valdez disaster, you had scores of images of ducks and otters slathered in crude. 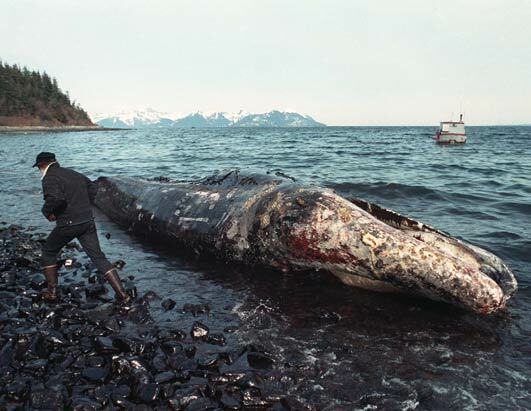 There were pictures of dead whales washed up against gleaming black rocky beaches. It was lurid—and impossible to ignore. By contrast, Brulle points out, not nearly as much oil from the BP accident has reached the shores of the Gulf Coast yet. Even groups like Greenpeace have only been able to rustle up a few pictures of a handful of ducks covered with oil. That's not the sort of thing that drives TV coverage. And it may mean that the current spill makes far less of a dent in public opinion than past disasters have. Part of the explanation here is that BP has been quite deft at managing appearances. For one, they've poured more than 300,000 gallons of chemical dispersants to break up the oil before it can reach the beaches, causing it to sink down to the sea floor. In some cases, these dispersants may be more harmful, ecologically speaking, then letting the oil wash ashore. We don't know what is in these chemicals and there's a very high potential that they could do a lot of damage to the food chain in the Gulf. That's precisely why Exxon was constrained from using dispersants in Prince William Sound back in 1989. But, from BP's perspective (and the Obama administration's), avoiding the sort of graphic imagery that Exxon had to deal with in Alaska has an undeniable appeal.